Clipboard Redefined extends the functionality of your clipboard memory, by allowing you to store and retrieve multiple text instances and graphic items at the same time. Hence, all the bits you need to reuse very often are kept in an organized list, where they can be easily viewed and reached whenever you need them. The major advantage of Clipboard Redefined is the fact that you do not need to change the way you do things normally. Thus, you just have to use the clipboard as per usual, by performing copy operations on the desired text chunks, which are then automatically stored and added to the list. 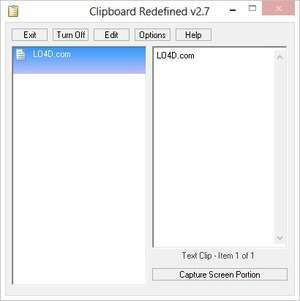 For security reasons, you should also check out the Clipboard Redefined download at LO4D.com which includes virus and malware tests. Additional screenshots of this application download may be available, too.